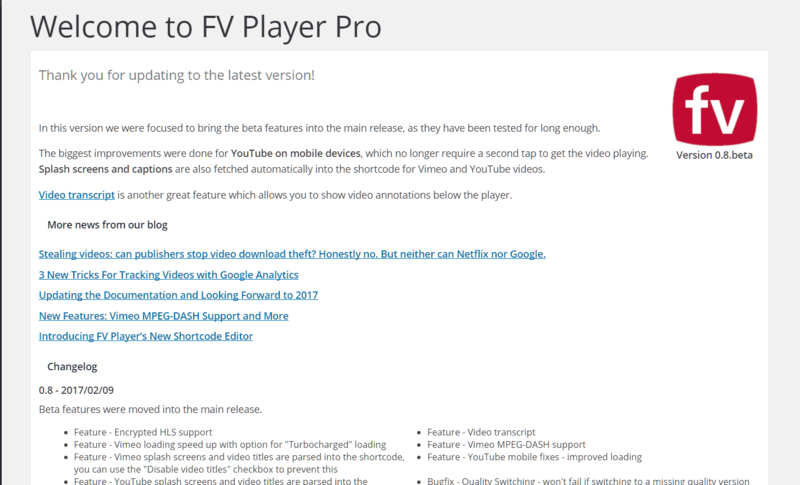 Controlling FV Player on desktop can be done by mouse, but also by using a set of keyboard shortcuts. These can be used in the fullscreen or when the mouse pointer is hovering within the borders of the video box. For instance, you can use the keyboard to start and stop the video, mute it, and change the volume or speed of the playback. Seek - use the left and right arrow buttons to jump back and forth on the timeline. The jump used to be 10% of the whole video time, but that was not very handy in a long video, so we have changed it to 5 seconds. Next/Prev video - this will work only with a playlist. When you press "Shift + n", you will skip to next video in the list. Pressing "Shift + p" will get you back to the previous one. 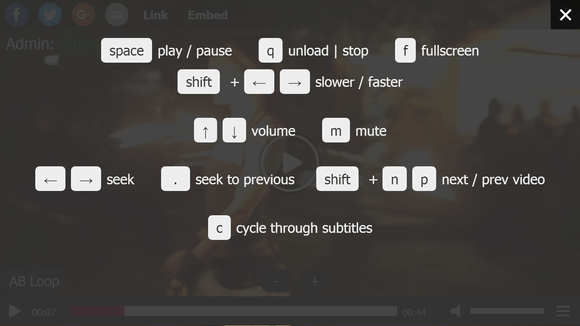 Cycle through subtitles - When you are using subtitles, you can use the "c" button to either switch between different subtitle languages, or you can use it to turn them on or off. The Pro users have access to one of the most interesting features we offer - the Interactive Video Transcripts. This will allow you to add a VTT file with subtitles and the player will create a transcript of the text under the video, which the user can follow, or use it for skipping to a certain part of the video by clicking on a line of text. All details about this feature can be found in this guide - Interactive Video Transcript. Fix for transcripts longer than 1 hour - transcripts of videos that were longer than 1 hour were having a number of issues, like mixed up lines of text and broken line skipping. That is now fixed. Cue numbers from the VTT files appeared in the body of the text. This appeared especially if the VTT file was used for subtitles. From now on, the cue numbers will be ignored, so you don't have to edit the whole file. The layout of the text was a bit random and there were problems with separating the paragraphs. While you can always use the <br /> tag for separation of the paragraphs, we have improved the formatting to automatically add a break every time a line ends a sentence and also every time there is no break for 30 seconds. When I started Foliovision, my idea was that I wanted to create a company that I would like to work in, and also a company that I would like to be a client of. of websites out of restrictive content management system into Wordpress, into open source world. for us, because we are crafting something personal for each of them. And this really makes a difference. All of our clients have really great stories and they all deserve to be told so it’s up to me to find a way to tell them online. We start by finding something special about the client and then we turn this special thing into something that’s a part of every marketing campaign we do. so I'm not just creating the websites for them, I also guide them through what the website does and how it works. We have a plugin tracking the number of post or website shares. that the sites like The New York Times, or the Guardian or any of these other huge sites enjoy.